As a little girl who would watch General Hospital with her mom, I was ecstatic when I found out we’d be visiting the set of General Hospital. And I love how many GH fans are still out there. The best part about visiting the set – learning all the General Hospital spoilers. The worst part? Not being able to share the General Hospital spoilers with your friends and readers. Here’s what I can show you. Thank you, Disney, for inviting me to the #HanSoloEvent and providing travel and accommodations. All opinions about my love for the fictional drama of Port Charles are my own. As we pulled up to the General Hospital set, I immediately started geeking out. My friend, Amiyrah, and I started to hum the music of the opening theme song and break out into a dance. We were excited! Then we were let onto the big stage where it’s broken up into many little sets. I tried to hold my composure, because you know, I was trying to be professional. But sometimes, you just have to let your inner fangirl go and let loose on your favorite soap’s set. I’m not exactly sure why I’m so pensive here at the Metro Court. Maybe somebody just dumped me. But remember that hostage situation in like 2007? No pensive thoughts there. So fun to get a peek at the General Hospital badges! 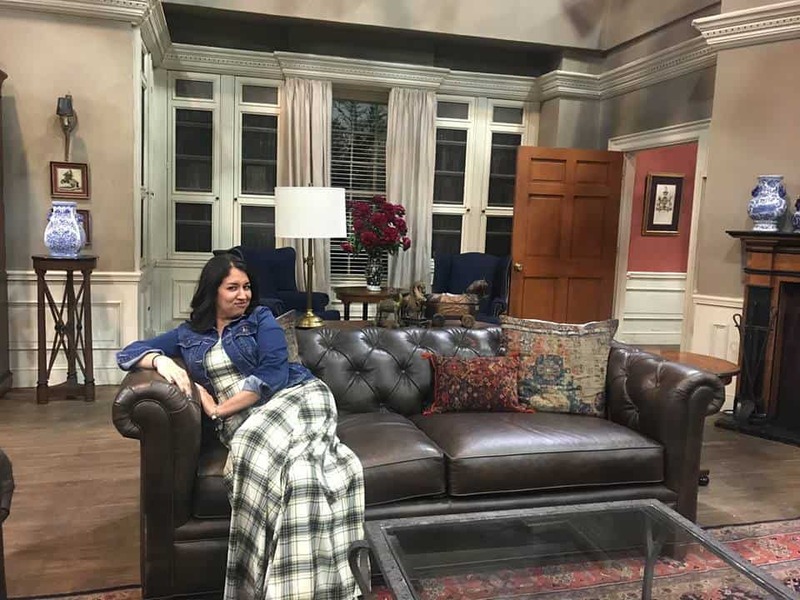 Hanging out on the couch at the Quartermaine’s house – no big deal! Um yes, totally big deal. This is what dreams are made of, people. We ran into some General Hospital cast members like Nancy Lee Grahn! She stopped to chat for a bit and was so nice. We also saw Finola Hughes and Michael Easton blocking for a scene. It was so fun! As we were walking around the different sets (they try to pack as many onto one stage for the budget), we saw a spoiler set! The whole set was a General Hospital spoiler, so we couldn’t even take any pictures. I saw a little bit being filmed on a camera, and it’s going to be good!! It’s hard keeping secrets. They told us the worst scenes for the budget – earthquakes and fires, because then you have to destroy things! We had to hold our pictures of the courtroom until today, because that was a potential spoiler. I have to laugh at this scene with our whole group of bloggers. We all wanted a part. I think we missed our calling as soap stars. I did have to crop this picture, because on the table in Maxie’s apartment is a spoiler!! I can’t believe I’m holding on to this secret, but I know all the details and it’s killing me not to share that big ‘ol General Hospital spoiler. Afterwards we got a sneak peek at a scene from the 2018 General Hospital Nurses Ball. I always loved Nurses Ball time! Then we got to chat with Executive Producer Frank Valentini, and Joshua Swickard, who plays Detective Harrison Chase. Watch out for Josh’s top-secret Nurses Ball performance. He’s quite the singer! And pretty cute, too, but whatever, totally didn’t notice. General Hospital’s annual Nurses Ball, this year sponsored by Olay, returns WEDNESDAY, MAY 16, and airs through MONDAY MAY 21. Founded in 1994 by Port Charles resident Lucy Coe (Lynn Herring), the Nurses Ball is one of fictional Port Charles’ most glamorous charity events, dedicated to HIV/AIDS awareness and research. This year, celebrity guest appearances include “The Chew”’s Carla Hall and “The Bachelor”’s Nick Viall. In her debut performance, Hall takes on an infamous role decades in the making; while Viall joins Aurora media maven Nina Clay (Michelle Stafford) on the red carpet, as they welcome viewers into what promises to be a memorable night. From Sam McCall’s (Kelly Monaco) stunning arrival to Sonny Corinthos’ (Maurice Benard) unwavering support and Jason Morgan’s (Steve Burton) tireless search for answers, as well as never-before-seen musical performances and a surprise proposal, the Nurses Ball promises to be this year’s can’t-miss event. “General Hospital” celebrated its 55th anniversary on April 1, 2018. Happy Anniversary, GH! It is both the longest-running American soap opera currently in production and the longest-running scripted television drama currently in production. Tune into General Hospital weekdays on ABC (check your local listings) or streaming or on the app.